Gotta love strawberries. And gotta love strawberries in cream even more. Maybe this is why my taste buds had me coming to this picture again and again. Then again, it might be the technical details of the shot that drew my attention. Getting a nice splash is hard enough but getting strawberry on spoon splash is nearly impossible. Read on for some musings, thoughts and tips. 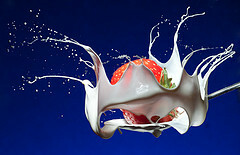 David Kittos took this wonderful splash using very simple recipe (As simple as strawberries in cream recipe). Aside some strawberries and cream David used a strobe, a gridspot some blue card and the special ingredient, a cross beam trigger circuit. Lighting: For lighting David used a Nikon Strobe. Any flash would do, however, there are two advantages to using a strobe here. It is easy to make a gridspot for it. And the output of it can be controlled to very low power setting. Talking about power setting, this is a key element of getting a good freeze motion shot. The lower the flash setting, the shorter the light burst is. David had to go down to 1/16. Going down to lower levels will produce even shorter bursts of light. So if you want a really short duration, you may need to use multiple strobes. The gridspot is there to control spill, so only the strawberry get the light. I love the backdrop approach here, gelling a flash for a gradient color effect. Exposure: The shot was taken at complete darkness (it is a strobe that freezes the motion), so David used bulb mode. This means that all the preparations have to be done prior to each exposure: filing the spoon with cream, setting the focus, and so on. Positioning: The general concept rocks. Place a spoon on a pony clamp and drop the strawberry. (Clamps are on sale now, 6 for about a buck @ Amazon). This is smart. The spoon is always @ the same spot, so pre-focus can be used. The berry had to be thrown from quite high to create the splash. Kinda hard to aim in the dark though. One thing that I think I’d do had I taken this shot (which I will soon), is to place another clamp right above the spoon. This way I can let go the little marksman inside of me and hit the spoon every time. Triggering: David used a flash triggering system called StopShot, but there are several systems and kits available on the market: The Hivits system and The Universal Timer are just two of the options, and you can always go DIY on the circuit as well. Make sure it has several out connections: for several strobes, for a camera, for a coffee maker. You never know what you’ll need to trigger in your next project. Make sure it has several in connections and accessories: Trigger with a microphone, a beam cross, pressure and more. Make sure – and this is absolutely critical – that you can create delay between the event that you are filming and the time of the strobe pop. In the image by David, there is a small delay between crossing the beam and hitting the soon. This delay can change depending on the berry’s speed, weight, the spoon to beam distance and more. Make sure you can control the delay. Inspiration: I love water drops and popping balloons. Really. Once you master the technique (using balloons and water drops) it is time to make your own say with a new idea. Speaking of inspiration, check out David’s photostream, and Chaval Brasil’s High Speed Photography set for some great splashes. Your Turn: Got a high speed photo tip or great image share with us in the comments. To see more great projects, visit the collection of Reader’s Projects.